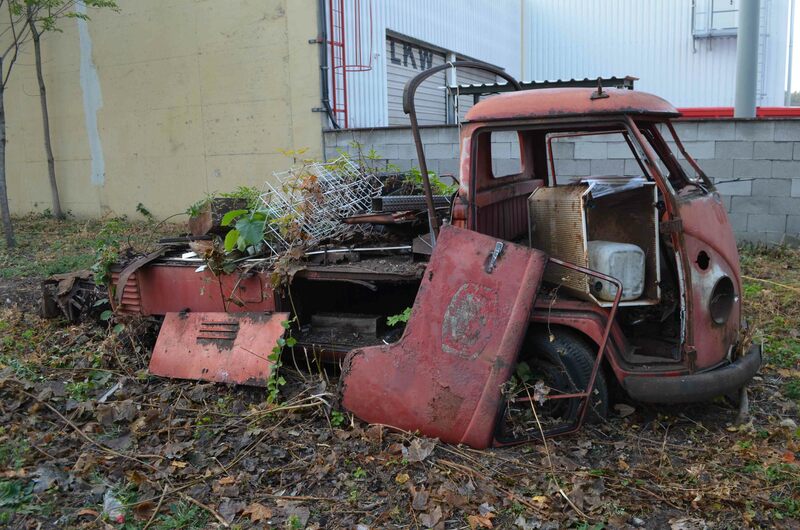 In late September of 2018 i received a hint about an early Volkswagen pick up that was sitting in the middle of my hometown Vienna. 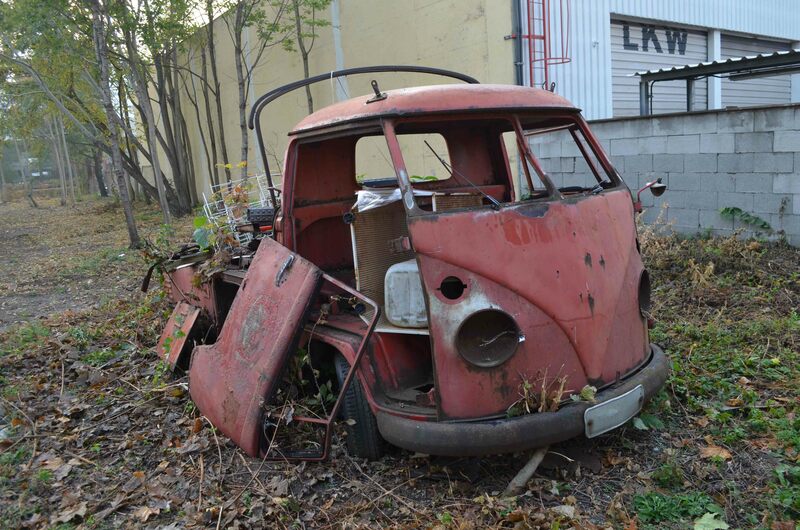 A couple of photos proofed that it really was a splitscreen single cab. It was very good hidden in an abandoned property in the north of Vienna. I was told that several works took place in this very same garden – for example they removed lots of wild growing plants and i was told that they might also remove some cottages.. or at least the ruins that were still standing. 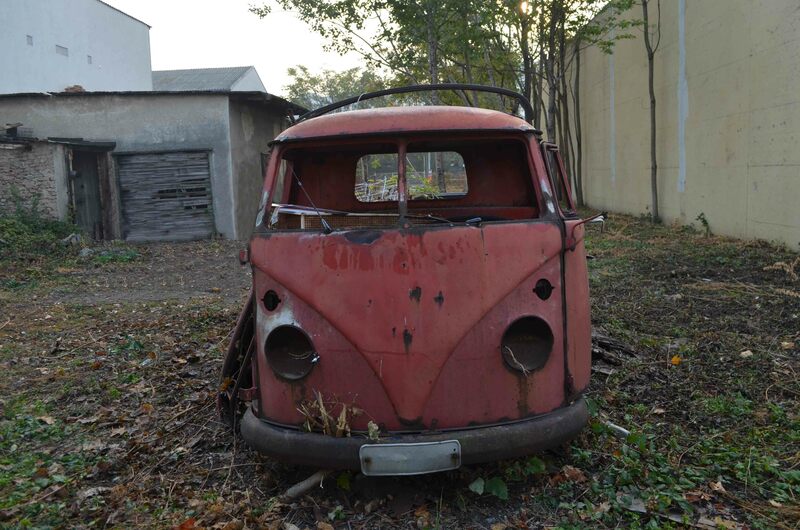 So I was afraid that they might also scrap the VW bus and visited that place immediately after work. I could not believe it. The vehicle really sat there – less than 5 minutes away from the house of my parents.. I couldn’t imagine how often I already had passed this property, as it is next to a highly frequented road where also the subway is driving above.. So it might had been possible to spot the VW out of the subway! I was very curious why it still sat there..
As i looked through the fence i could see the rear side of the vehicle, sitting at the very other end of the property. It was clearly visible that lots of work happened on this property not long time ago. I walked around the block and managed to looked over the opposite fence that was closer to the single cab. But as I didn’t want to enter the property without permission, i took some pictures and went home again as no owner or neighbors were present. Right on the next morning I managed to research the name and contact datas of the owner. After the first phone call it was clear that the car was sitting for a very long time. His father bought it as a donor for parts back in the 1970s. Since then it sat there, outdoors without any protection. He couldn’t tell me any more beside the fact that it still had a 6 Volt system – so I already knew it was a pre Mid-1966 model. Sadly he didn’t have time for me and so it took some weeks before we could meet and my father and I could take a closer look at the old, neglected VW. The owner did not have much time for us – we spent half an hour looking at the car and talking about it. After some closer looks, it was clear that the car was in really bad shape, worse then expected. I snapped some photos and tried to convince him to sell his barndind to me. As you could see, all windows were missing. 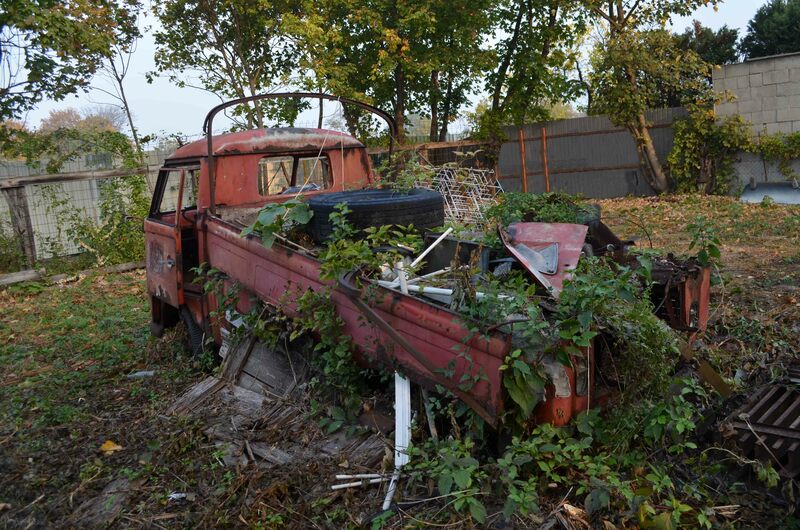 Some children from the neighborhood often played there without permission and had their fun destroying the old VW. Furthermore all headlights and indicators were also removed at some point and many lids and doors already fell off. On the load bed there was lots of junk. The rain and the time did lots of work.. I already knew that it might not be easy to pull this vehicle out, as the driver cabin might break off. 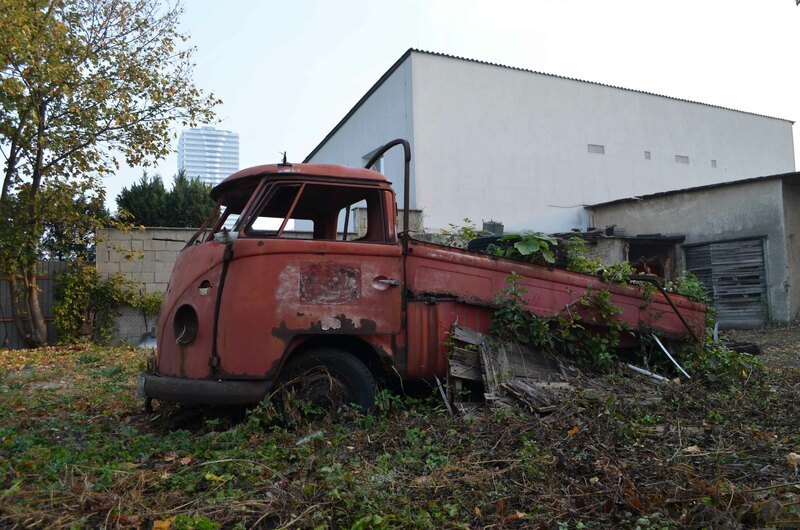 But I wanted to save that car and neither scrap it nor use it as a donor, as this VW was from the neighborhood, maybe an old firebrigade (see logos) and maybe it also came from the car graveyard of my grandfather – where we also found this pre Mid-1953 barndoor chassis! But all in all the cabin made a more or less solid impact and steering wheel as well as the column still were present. But i was not sure about the manufacturing year. A good friend told me that some things (indicators, rear window, door handles..) said him that i must be a 1963 VW sincle cab. But as I took a closer look at the M-plate it said 1960. Of course that did not match with the big rear lights and the big indicator lights at the front. .. strange .. but maybe a birth certificate will tell more some day. As time passed by very fast, the owner listened to my offer and nearly was ready to fix the deal, but he said that he also wanted to meet with 2 other guys that were interested in buying the car. He said he would call me in a few days..
That did not happen. And so i called him some days later. Of course the car was already sold.. All the effort for nothing.. too bad. But in the same week I was lucky enough to find out who the new owner is. It’s Flo from DLV club – he was already trying to buy the VW for a few months. So I am glad that the car is in good hands now. 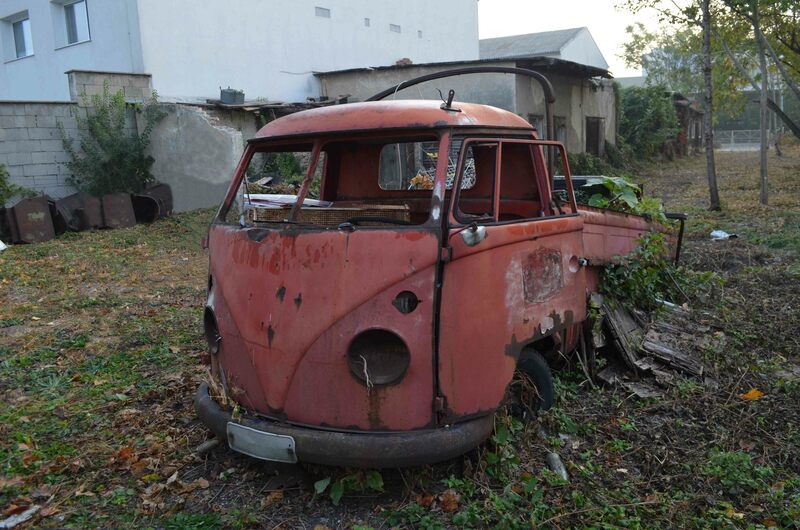 If we would have bought it, it might would have been waiting for a very long time before it would have received the necessary attention – as we are currently restoring Eve, our 1967 VW Bus. So all in all the story showed me once more how important contacts are and that barnfinds still exist – even in the big city of Vienna! So keep attention when you go through the streets, you never know what cars might sit there!